It’s been far too long since I’ve cooked with coconut milk and this stir fry was a wonderful reminder I need to do it more frequently. It keeps the chicken super moist, lends creaminess, and a light sweetness that only coconut milk can. I seriously wanted to drink the broth-sauce. Use coconut milk in a can (usually found in the Asian aisle), not cream of coconut, not coconut cream, not coconut oil, and not coconut milk in a carton that’s refrigerated. I used lite but you can use full-fat. 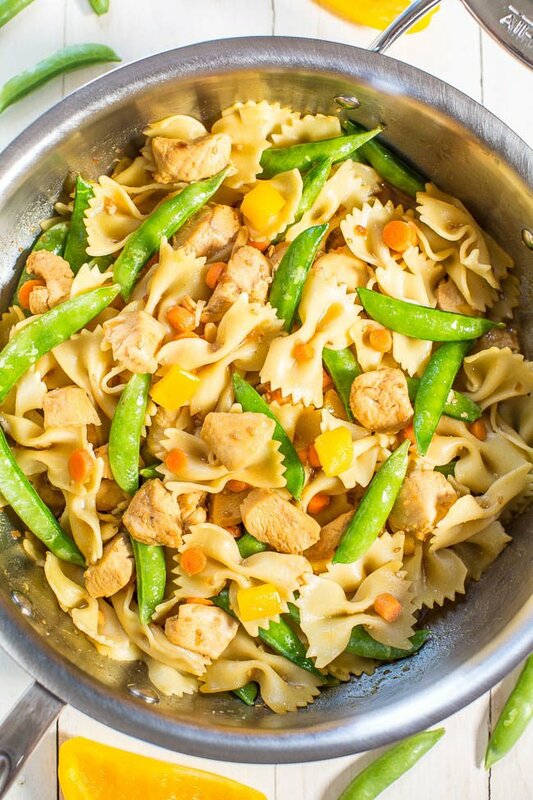 The stir fry is easy, ready in 20 minutes, and has texture and layers of flavor galore. 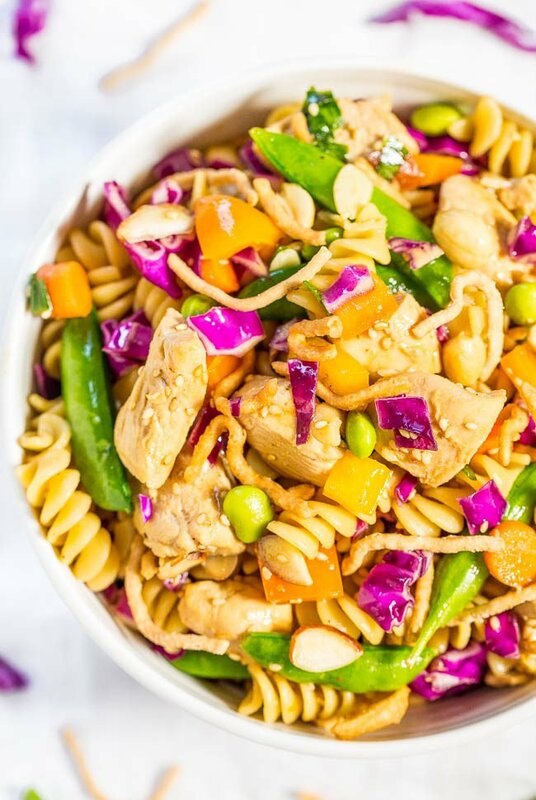 I only like stir fries if there are lots of veggies, tons of crunch, a rainbow of flavors, and this one delivers. You can mix and match ingredients based on what you have on hand and enjoy including the vegetables, seasonings, and herbs. I used broccoli, sugar snap peas, red bell peppers, carrots, and green onions which add crunch and crispness. If you prefer more heat, use a red chili or a serrano or jalapeno pepper. Like curry? Add a tablespoon. Have spinach, kale, or greens to use? Toss in a big handful. Want to keep it vegetarian? Use tofu or tempeh. So versatile and healthy. 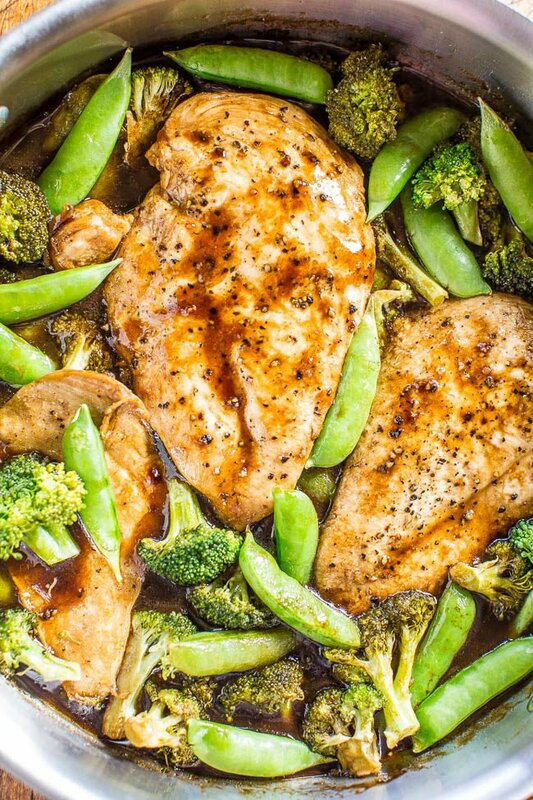 Soy sauce adds saltiness, ginger adds a mild heat, lime juice brightens it and really is a showstopper, brown sugar sweetens it, and garlic adds rich flavor. Cilantro and basil finish the stir fry because there’s nothing like fresh herbs for that final touch. Serve as is or with rice if you like. Coconut milk keeps the chicken super moist, lends creaminess, and a light sweetness that only coconut milk can. Use coconut milk in a can (usually found in the Asian aisle). 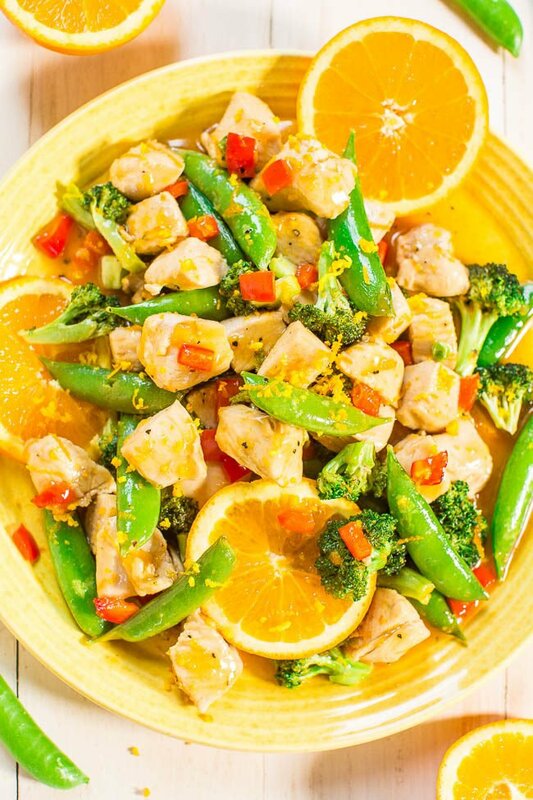 The stir fry is easy, ready in 20 minutes, and has texture and layers of flavor galore. 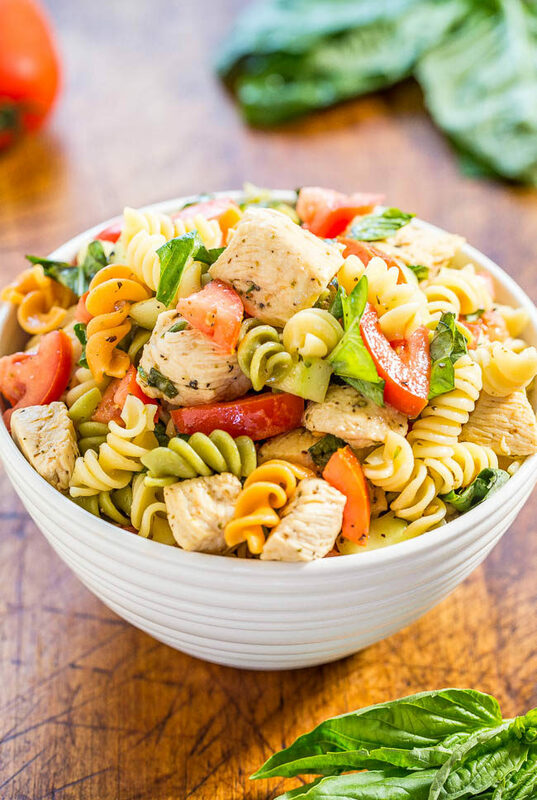 Mix and match ingredients based on what you have on hand and enjoy including the vegetables, seasonings, and herbs. It’s so versatile and healthy. Serve as is or with rice if you like. To a large skillet, add the oil, chicken, season with salt and pepper, and cook over medium-high heat for about 3 to 4 minutes, or until chicken is about 80% cooked through, stir and flip intermittently. Add the lime zest, lime juice, garlic, ginger, stir to combine. Cook for about 1 minute, or until garlic is fragrant. Stir intermittently. Add the coconut milk, soy sauce, brown sugar, salt, pepper, and stir to combine. 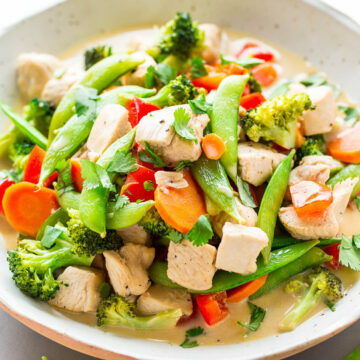 Add the broccoli, sugar snap peas, red peppers, carrots, green onions, bring coconut milk up to a gentle boil, and allow vegetables to cook until crisp-tender, about 3 to 5 minutes. Taste broth and make any necessary seasoning adjustments, i.e. more salt, pepper, lime juice, soy sauce, sugar, etc. Evenly sprinkle with basil, cilantro, and serve immediately. 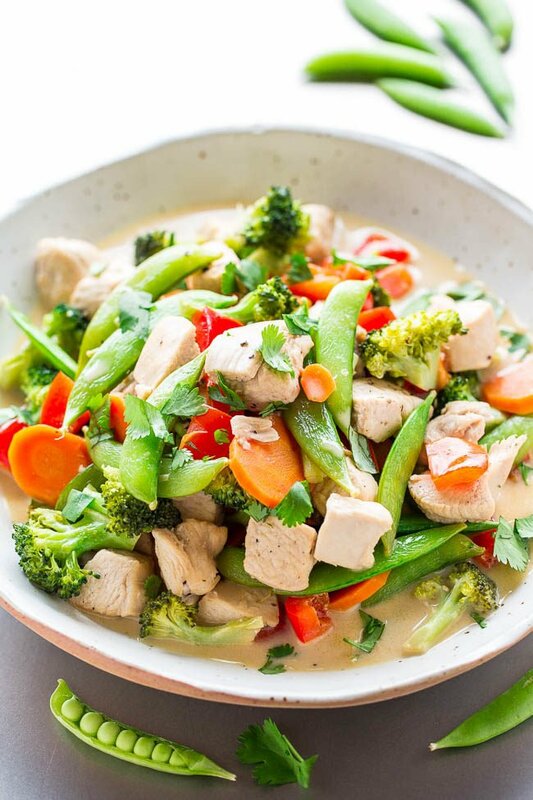 (Immediately upon taking the stir fry off the heat, there was quite a bit of excess coconut milk broth but as it cooled some of the broth must have soaked into the chicken and veggies and the overall volume appeared reduced after about 30 minutes). Stir fry is best warm and fresh but extra will keep airtight in the fridge for up to 5 days, reheat gently as desired. 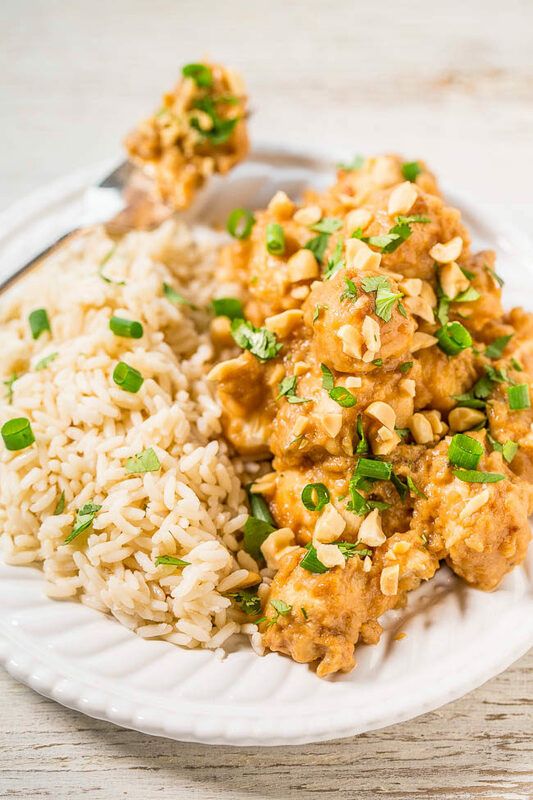 Slow Cooker Thai Peanut Chicken – The easiest peanut chicken ever and your slow cooker does all the work!! Topped with crunchy peanuts, cilantro, green onions, and the peanut sauce is irresistible! 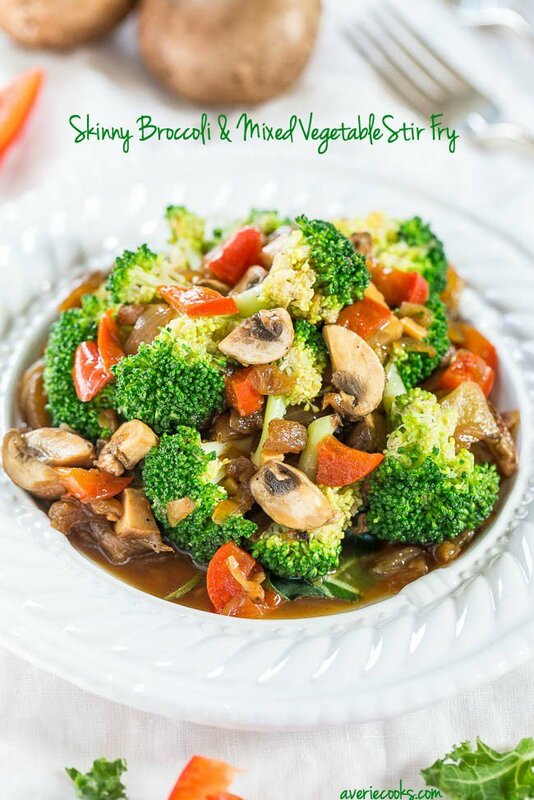 Skinny Broccoli and Mixed Vegetable Stir Fry – Skip takeout and make your own fast, easy, and healthy stir fry! Think of all the money and calories you’ll save!! This looks delicious and I love Thai flavors! Jon fractured his wrist last week and had to have a plate put in on Friday (crazy story) so I need to make meals that don’t require a knife for the next 2 weeks til his cast comes off. Stir fries and slow cooker recipes should be perfect and you’ve posted several good ones recently! I hope that Jon heals up quickly and what an ordeal! I’m so sorry! My daughter broke both arms within 18 months of each other due to sports injuries and I am well aware of what life in casts is like…for everyone involved! Hope you guys are hanging in there! Thanks for the kind thoughts–he’s doing well and was happy I made this today. We were due for some Thai flavors and it was excellent! I had fresh basil to garnish but forgot to get cilantro so I used some dried instead. He also had a concussion but I am the one who has been forgetful this past week?! I will remember to make this again though. Wow he sounds like he’s been through the wringer but hopefully on the mend! Glad you were able to give this one a try and really basil or cilantro, flip a coin, I love them both and you could use either here and I’m sure it would be great! Thanks for being specific about what kind of coconut milk to use. I haven’t cooked with canned coconut milk before and this looks like a good starter recipe. Yes and there are so many different options in the past 5 years or so. This is a perfect starter recipe! These flavors are my favorite for stir fries! I just made a soup with coconut milk for the first time in ages. Thanks for the photo compliments. I made this ages ago and it kept getting pushed back. Spring/summer lighting is just glorious. You can tell the difference from fall lighting, well I can at least :) Your soup sounds great! This looks really good! I love coconut flavors in, well, anything. 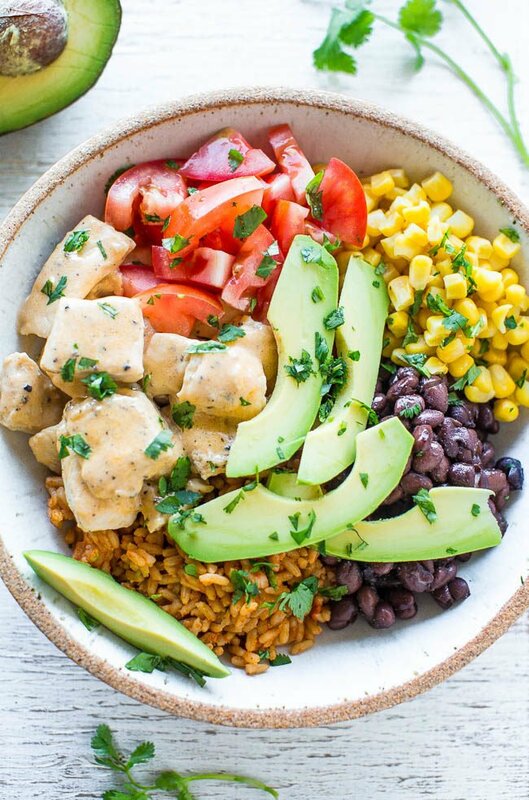 This is getting added to the dinner list! You’re rocking it over here! 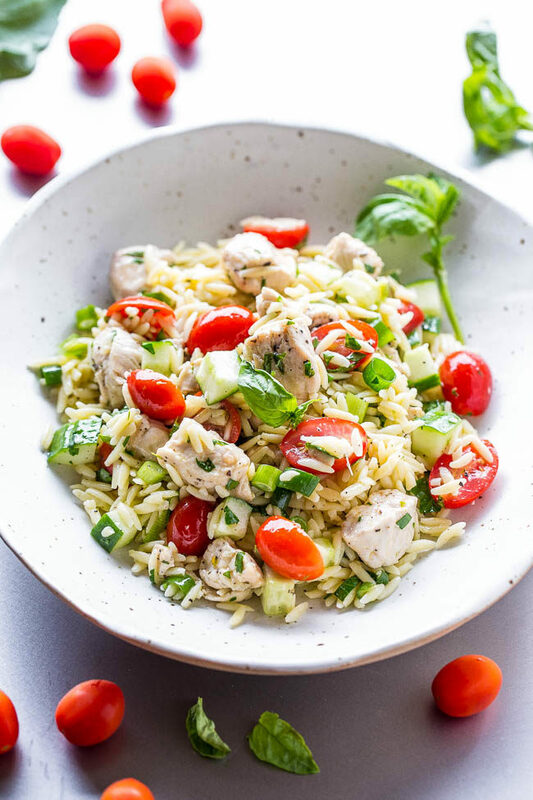 Love love love this recipe and it’s versatility… cannot wait to whip this up! Looks great Averie! 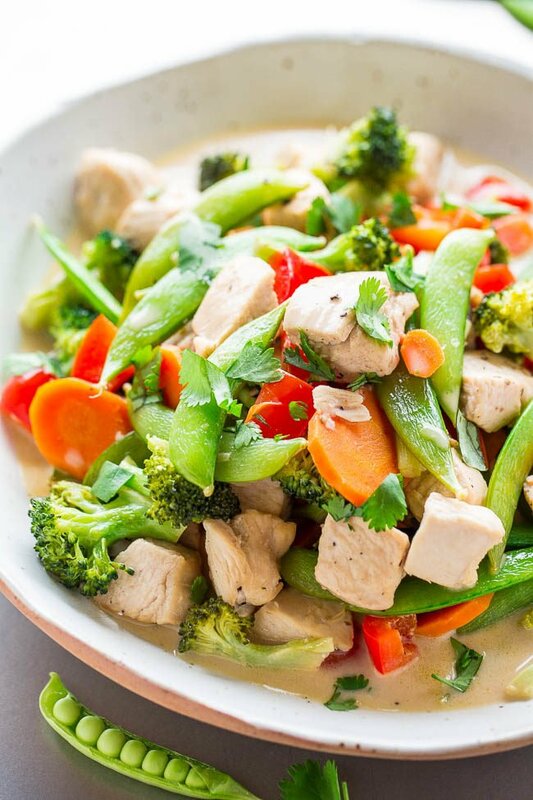 I’m a big fan of green curry, so I would probably swirl in some green curry paste as well. I didn’t even think to add green curry paste…that sounds wonderful! The flavors in the sauce are amazing! I have used coconut milk and curry powder or paste before, but the coconut with the lime and other seasonings were great and so different! Will definitely make this again! I also just used a bag of frozen stir fry veggies to cut down on the chopping time. Thanks for another delicious, quick recipe! Thanks for trying the recipe and I’m glad it came out great for you! I love coconut and lime and glad you’ll make it again! Glad the frozen veggies saved time! Made this tonight and my whole family loved it, even the 8 and picky 6 year old. Changed the veggies to carrots, zucchini and frozen broccoli. I used full fat coconut milk. Amazing!!!!!! Thank you so much!! I’m keeping this one for company too. Easy and tasty! Thanks for trying the recipe and I’m glad it came out great for you! I love that even the picky kiddos enjoyed it. And yes, very flexible to swap veggies in and out depending on what you have. Wow! it looks so amazing and fresh. I love Thai food but they are too spicy for me at the restaurant. The only one Thai dish I can cook at home is Thai sprawn soup. Really jealous of how your recipe looks wonderful. Don’t be jealous – it’s easy to make yourself! asparagus and served it over Jasmine rice. ginger I have on hand. I am not one to follow a recipie exactly but I did this time because the ingredients sounded so good. I even zested a lime (I didn’t even realize I had a zester but my friend unloaded her kitchen supplies on me when she moved and included a garlic press too! )So, I did everything the recipie said including using lite coconut milk (which I highly recommend because it was very smooth). All in all the recipie was absolutely delicious. We ate so much that we couldn’t move. If you’re going to take the time to buy and chop veggies, this is the recipie to try. 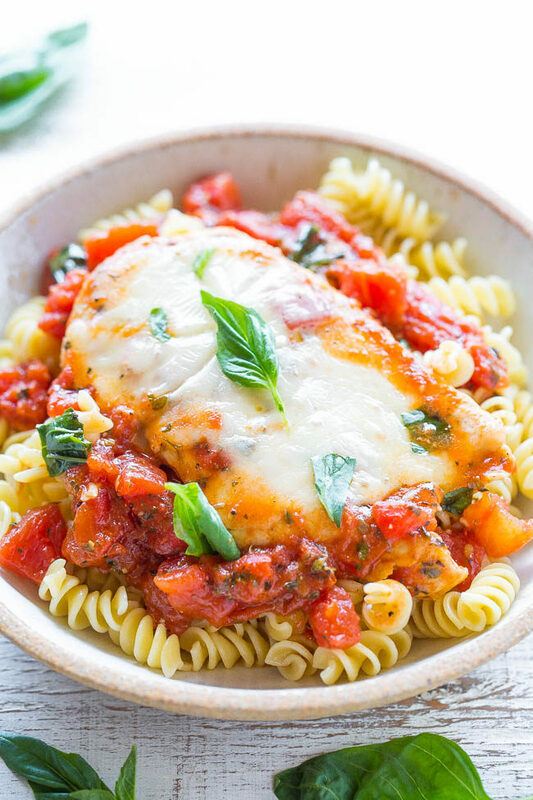 It really didn’t cost very much as you only need a small amount of each ingredient.The basil and cilantro really added a wonderful punch at the end and the sauce was incredibly flavorful.Bravo! I will be making this recipie again and again! And my husband now thinks I’m a pro so thank you so much for sharing it! Thanks for the 5 star review and glad you loved this! Love that you impressed your husband, too! Made this tonight(Brought it down to a single serving, worked perfectly) with a little green curry paste and O.M.G!!! It was amazing!! Thanks so much for passing on such a great recipe, will definitely be making this again!! Thanks for the 5 star review and I’m glad the green curry paste worked great and that you will definitely be making this again! Thanks for the five star review and I’m glad it turned out great for you!